Ardent fans of homemade corn tortillas, papusas and pleasantly plump gorditas know that arepas belong in Latin America’s reigning family of corn-based flatbreads. 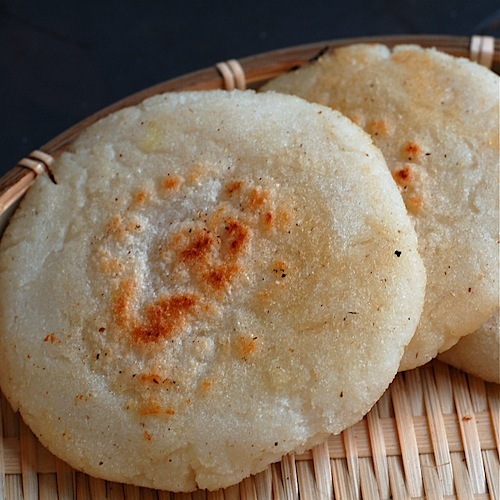 A staple in Venezuela and Colombia, arepas fill the workaday cook’s most important need: foods that are easy to make and easy to use and never boring. Early recipes required only cornmeal and water. Most cooks now season with a bit of salt, while some lean toward richer versions with milk, lard or butter in the dough. In Venezuela, arepas tend to be split and filled like sandwiches, while the thinner, leaner versions typical of Colombia are often topped with minimalist fillings for breakfast. Both make perfect handfuls of snackalicious treats when filled with scrambled eggs, cheese, black beans, shredded or sliced meats, avocado, chorizo, spicy cole slaw or whatever leftovers you have hanging out in your fridge. You can dip them into soup or stews. You can even, if you have a pot of tea or coffee at the ready, split them in two, toast them with butter and then spread liberally with homemade jam for a treat every bit as satisfying, if not as proper, as well-made scones or biscuits. If you’re Venezuelan, you might have a Tosty Arepa on your kitchen counter. Or you might just walk down the street and grab one from any number of street vendors or eateries selling freshly made arepas around the clock. Fortunately for us up north, they’re incredibly simple to make. Unlike many other flatbreads from Mexico, generally made from nixtamalized maize (an ancient, lime-based technology used to loosen the hard hull of corn kernels), arepas depend on untreated corn that has been precooked then ground finely. Head to your nearest Mexican or South American market and browse right next to the masa harina for the precooked corn meal ground especially for arepas. The most popular brand of masarepa or arepaharina, Harina P.A.N., comes in a bright, yellow package that’s graced with a smiling woman in a polka-dotted head scarf. Don’t even think about making this with regular cornmeal. Some recipes use masa harina, but purists will insist that you track down the real deal. Once you have the precooked cornmeal, all you need is a sprinkle of salt, some water and an oiled skillet or griddle. If you’re feeling fancy, you can stir butter or olive oil into the dough. Arepa dough is super kid-friendly. The youngest ones will love its very moldable texture, so parents may want to make extra. For adults who like to play in the kitchen, consider arepas the first step to learning how to hand-pat thinner, more difficult corn tortillas. Keep a small bowl of water nearby; a small amount wiped on your palms will keep the dough from sticking as you roll and pat. Less dextrous cooks, young and old, can simply shape rounds against a flat surface rather than between two palms. Some like to form hefty rounds and then later remove the interior to make space for savory fillings. I usually make mine thin and crispy, but fluffier versions are great for soaking up sauces. 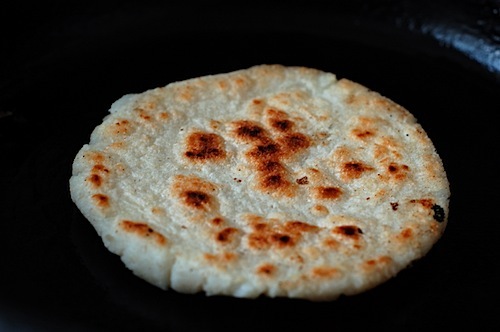 Many recipes for thick arepas, resembling English muffins or hamburger buns, now call for browning on both sides in a pan and then finishing in the oven, right on the rack, for 20 to 25 minutes until they’re puffed and cooked through. Traditionally, though, they were cooked completely on a comal or griddle. 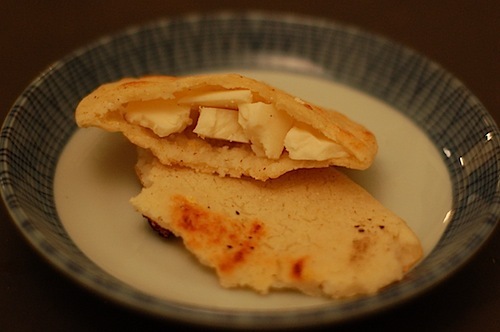 One of my favorites ways to enjoy an arepa — hot from my biggest, heaviest cast-iron pan — is to fill it with a single, thin layer of nabulsi cheese, an early experiment with leftovers that became a surprisingly good pairing. Nabulsi, a brined, boiled cheese from the Mediterranean, has a dense, smooth texture and a lovely flavor derived from caraway or nigella seeds and ground cherry pits. Slipped into the still steaming arepa and left for a minute to melt gently, the cheese complements perfectly the tender corn of the bread. Roast chicken and guacamole make another excellent filling for an arepa. If the night-time hunger pangs hit while you happen to be in New York, generally in the vicinity of Queens and specifically near the intersection of Roosevelt and 78th, then — lucky you! — you can stop by the Arepa Lady’s cart to taste the essence of soul-satisfying street food: sweet arepas filled with soft, fresh cheese. If, back here in San Francisco, you’re strolling through the Mission District, swing by the 24th Street BART station and try one at Mr. Pollo. They offer sweet and savory versions, and all I can say is: save room for both. The technique of sprinkling the cornmeal into the water, rather than pouring water over a pile of cornmeal, helps prevent lumps. Stir together the water and salt in a large bowl. Slowly sprinkle in the cornmeal and stir to incorporate. The dough will look very wet, but after a few seconds the cornmeal should soak up the water completely. Knead the dough in the bowl for 5 minutes. If the dough sticks to your hands, sprinkle in a little more cornmeal. 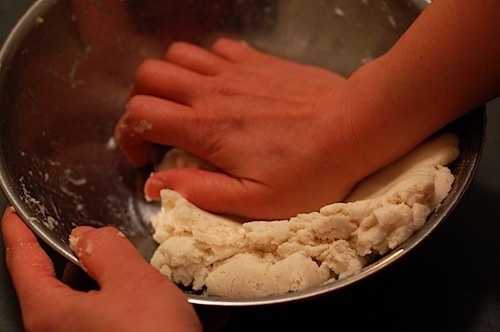 If the dough cracks at the edges and does not form a ball easily, then add water, drizzling in a tablespoon at a time and kneading well to incorporate after each addition. Divide the dough into 6 equal parts. Moisten hands, then roll each into a smooth ball. Pat with your palms, pressing gently and evenly, to make rounds about 1/2-inch thick. Heat a heavy skillet or smooth griddle over medium. Add a small amount of oil and cook the arepa until golden brown and crisp, about 5 minutes on each side. The interior will remain very moist. Transfer to a rack or paper towels and let cool slightly. Split with a sharp knife into two thin halves and fill as desired. Lovely! I will definetly try these! Thank you! Next Next post: Hungry for Change: FOOD, INC.